Either way, we answer all of your questions about heat pump pool heaters as well as review several of the best pool heat pumps you can buy. We hope you find this guide helpful. You’ve found the best pool heat pump guide on the web. It’s got the technical facts and is crammed with information about pool heat pumps for in-ground and above-ground pools. Pool heat pumps allow you to open your pool earlier in spring and extend the swimming season in the fall. A pool heat pump adds value to your home and lasts a lifetime. Unlike conventional pool heaters, heat pumps use electricity and mechanical power to heat the pool. It’s efficient and is the most cost-effective solution for pool heating. In this article, we’ll review the best pool heat pumps for in-ground and above-ground pools. I’ll explain how they work and discuss their virtues and disadvantages. As well as give you all the information you need to size your heat pump. This article will guide you through your choice of the best pool heat pump for any type of pool and explain how to install and use it. I’ll then go on to cover many other topics. FibroPool FH 055 (55,000 BTU) for a 21’ round pool or 15′ X 30′ oval. We also compare the pool heat pump to alternative pool heaters and answer all your pool heat pump questions. If you search the internet, you will find hundreds of websites that try to explain how a heat pump works. Unfortunately, most are misleading. So I’m going to explain it in a way that will help you understand the principles. I’ll keep it short, stick to simple terms, and skip the complexities. When you release compressed propane from a tank, it’s icy where the gas escapes because it absorbs heat from the air as it expands. By compressing air in a bicycle pump, you will notice it warms up to the point of burning your finger. These two principles form the basis of the refrigerator cooling system. A special refrigerant gas in a closed system is compressed to the point where it becomes a warm liquid (200°F). The warm liquid then moves through the condenser (where you could feel the heat), this allows it to lose some of the latent heat. The cooler pressurized liquid then progresses through a restrictor, at the entry to the evaporator inside the refrigerator. The fluid expands into the evaporator to become a gas and, in doing so, absorbs heat from the inside of the refrigerator. Then the gas moves back to the compressor to complete the cycle. Now, remember, the inside of the refrigerator is ice-cold but still enough heat is released at the condenser to burn your hand. A pool heat pump uses the same principle as the refrigerator, but the heat in the condenser heats the pool water. Instead of taking heat from an enclosed area, the heat is transferred from the surrounding air. The proper name for a heat pump condenser is a heat exchanger. It’s designed to efficiently transfer the heat to the pool water that is circulated through it. The water temperature is increased by 3 to 5 °F as it circulates and the warmer water flows back into the pool. A fan circulates the outside air through the evaporator to make the heat transfer more efficient. The compressor used in the heat pump is a lot more efficient and powerful than the one in your refrigerator, so the whole process is more efficient. The reason we say the process is efficient is because the compressor uses a lot less power than any other form of electric heater would use. In summary, heat from the air is absorbed at ambient temperature by the expansion of the liquid to form a gas. This gas is then passed through an electrically driven compressor to increase the pressure. The increase in pressure causes a rise in temperature, and this high-temperature fluid passes through a heat exchanger. At the heat exchanger, the heat in the gas is used to heat the pool water circulating through it. For each of the models reviewed, we’ll estimate the cost/hr of running the unit based on the lowest and highest averages. I obtained the averages from the following table. We selected specific BTU models for the review, but obviously, all manufacturers offer a full range of outputs. 140,000 BTU heat pump engineered to last for many years. High quality components come together in this classic heat pump that consumers love. Lighter Weight – Less than 250 lbs. ✓ View or download the MANUAL for the HeatPro HP21404T. 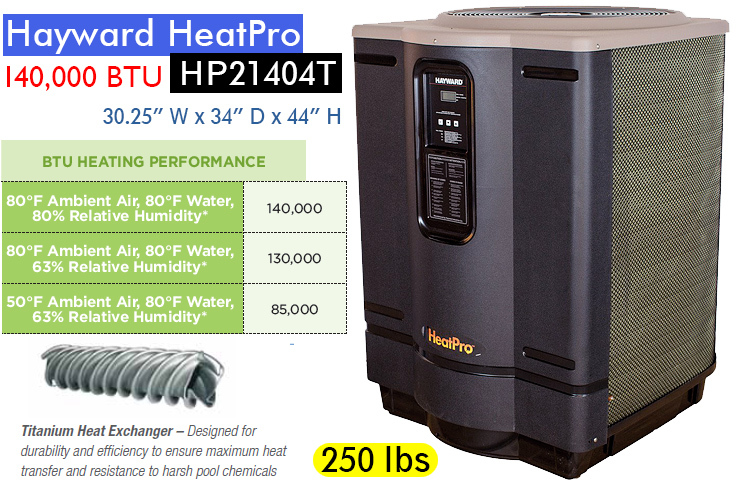 The Hayward HeatPro HP21404T is a 140,000 BTU unit and is suitable for an 18,000 gal in-ground pool. The HeatPro in-ground heat pump is designed specifically for pool heating, it does not have an option to cool the pool water. That seems just fine to me, why pay to cool the pool – that’s going to happen naturally anyway. The Hayward HeatPro has a durable, injection molded cover that’s UV-resistant. It looks good next to the pool, and it’s easy to clean. Pool heat pumps should be placed outside and not under a roof or inside a building, as close to your pool pump as possible. So it’s great to know that the Hayward HeatPro will blend in beautifully next to your pool. I really like the fact that the panels are padded on the inside. This makes the machine as quiet as possible. It ensures a blissfully quiet environment around the pool. The body panels are also easy to remove when you need access to the machine for service. Designed to be highly corrosion resistant especially in coastal areas. Pool heat pump evaporator cooling fins are exposed to the environment. Air is continuously sucked through it and dirt will collect on the evaporator. In a humid environment like at the coast, the dirt and humidity create a corrosive deposit. For this reason, the Hayward HeatPro uses an Ultra Gold corrosion resistant evaporator fin, making it more durable, especially if humidity is a problem. A polyethylene screen protects the evaporator coil. All these factors combine to make the Hayward HeatPro and extremely durable pool heat pump. You can rest assured that the machine is going to take care of itself. All HeatPro pool heat pumps have an electronic control board with a service analyzer, which monitors the vital workings of the unit. It will switch the machine off and give warnings when things go wrong and will stop the compressor when there is no water flow, or the refrigerant circuit is faulty. A flow sensor prevents the machine from running when the flow rate is too low – the flow rate needs to be within 30 – 75 Gal/min. Should the main filter become blocked, the heat pump will shut down. A temperature regulator in the control unit maintains the ideal water temperature. It’s easy to set, and you choose either pool or spa mode. The heavy-duty scroll compressor is designed for continuous running, so there’s no need to be concerned when it runs for many hours. A pool heat pump will run for longer compared to combustion types to accomplish the same results. Occasionally, the heat pump may run for up to 24 hours per day. However, this should not concern you because the heater is designed to operate continuously. Despite the continuous operation, it will still heat the pool far more economically than other types of heaters. Heat pumps use a lot of power, and this one uses 7.2 kW/hr at 240V. Therefore, it requires a circuit that can handle at least 42 Amps. As for estimated running costs, it will depend a lot on where you live, with a cost ranging between 68 c/hr and $1.40/hr. (Dec. 2017 data). It will cost, at most $33.60 /day when heating the pool for 24 hours. Obviously warmer climates will be on the lower end of the scale and colder climates will be more expensive – this is the case with any pool heater. The titanium counter-flow heat exchangers used in Hayward Heat Pro heat pumps are suitable for all kinds of pool water, including pools using a salt-water chlorinator. Even though it can withstand the rigors of pool chemicals, it must be protected from winter freezing by emptying the unit in the cold months when not in use. Hayward has been doing business for over 80-years, manufacturing technologically advanced pool equipment worldwide. They have service centers all over the USA and have free helplines. The HAYWARD warranty covers the unit for defects in materials and workmanship. Warranty labor is included for 10 years in the state of Florida. Best pool heat pump that performs as you would expect. Will quietly and efficiently keep your pool at the perfect temperature. In 2015, a trademark licensing agreement was signed with Hayward Industries for Trane-branded pool heaters. This gives their customers the benefit of the combined experience of two industry giants. To this end, the Trane Tr21474T is AHRI certified. AHRI (Air-Conditioning, Heating and Refrigeration Institute) is an association comprising nearly 350 manufacturers. It establishes comparison standards for HVAC products. Units are tested at random to confirm that they perform as advertised. It’s comforting to know that both the Trane and the Hayward pool heat pumps are tested and that they perform as you’d expect them to. Like all the pool heat pumps in this review, the Trane TR21174T has a titanium heat exchanger and a corrosion resistant evaporator coil. Titanium is the most corrosive resistant material, so it makes perfect sense to use it for pool equipment since it offers the longest service life with chlorinated pool water. The Trane and Hayward machines look very similar with controls and molded panels that are basically the same. Although there are some minor differences. On the Trane models, the plumbing is accessible from the front of the unit while the Hayward has the connections at the back. The Trane is pleasantly quiet with very little vibration – you’ll hardly hear the circulation fan when it’s running. Controlling and monitoring your pool temperature is a really simple task. You can adjust the temperature setting in increments of 1°F, and the pool temperature is permanently displayed on an LCD screen. This screen will also display fault codes for easy diagnosis if there’s a problem. The TR21174T is perfect for pools up to 32,000-gallons, though it’s recommended that a larger pool be covered when not in use. A 32,000-gallon pool is quite big, about 43’ x 26’, with an average depth of 3.82 feet. It should work nicely with an uncovered pool of 15,000 gallons in most regions of the US when used during normal pool seasons. One should bear in mind that regardless of your climate, you’ll always save money by covering the pool with a thermal cover. The Trane is compatible with saltwater pools as long as the chlorinator is downstream of the pool heat pump. This doesn’t mean that it can handle sea water, it will handle a salt content of 3,400 PPM used to generate chlorine. Based on average electricity prices (as of December 2017), the Trane TR21174T 110,000 BTU comparative running costs will be between 49 c/hr and $1.01 /hr. When paying the highest rate, it will cost about $24.27 /day when heating the pool for 24 hours. The Trane reputation for manufacturing high-quality products and providing excellent service is well established. This is a pool pump that you can buy with complete confidence, in the knowledge that you’re going to get fantastic service for from it for a very long time. BTU and efficiency performance independently certified by AHRI. The Pentair Ultratemp 70 Heat pump is designed specifically for heating swimming pools, and it has settings for a spa. As with all Pentair products, it has a lot of fantastic features and has a very intelligent controller. The self-diagnostic control panel that monitors and troubleshoots the heat pump differs from the Hayward and Trane. It has an Autoset feature that will over-ride the time clock to ensure that the water temperature is kept constant. The Extend (time clock over-ride) feature monitors and maintains water temperature to prolong a heating cycle that has been interrupted. The Adjustable timer mode allows you to set the heat pump to run for a predetermined time. One of the big advantages of this model is the automatic defrost feature that senses the refrigerant temperature and keeps it from freezing. Normally, the evaporator becomes too cold when there’s a drop in air temperature and, with high humidity, they tend to freeze up. To prevent freezing, the compressor will stop, but the circulation fan will continue to run, allowing the evaporator to normalize. It has an amazing user interface with an LCD control board that displays intuitive, menu-driven readouts with easy to follow, full word messages. You can even connect the UltraTemp Heat Pump to a home automation system using spade terminals or an RS-485 communication connector at the back of the control board. This gives you full control of your pool functions from inside the home. A 100% titanium heat exchanger assures corrosion-free extra-long life and it uses the highly respected Emerson Copeland scroll compressor. Scroll compressors are more efficient, durable, and reliable than piston-driven compressors. The compressor and HVAC controls are of the highest standards, and this unit should last a lifetime. The Trane heat pump has a threaded drainage outlet at the base of the heat pump. A drain hose barb thread into the outlet so you can connect a 5/8” garden hose to the hose barb. For the 70,000 BTU unit the running costs, depending on where you live, will be between 30 c/hr and 62 c/hr using the Dec. 2017 data. At the highest cost, you’re looking at $14.88 /day when heating the pool for 24 hours. The warranty covers the compressor parts for 10-years, and Pentair offers a lifetime warranty on the titanium heat exchanger. This would be my first choice for an in-ground pool heat pump. I like the unit and its controls, the documentation is good, and it is a good brand. At the same time, I would install a thermal blanket for the pool. That way, I could use a smaller unit and save on the installation and the electricity bills. Pentair has been in business since August 1966. Its central U.S. office is located in Minneapolis, Minnesota. They also have service centers all over the USA and have free help lines. Using a pool heat pump with your above ground pool makes as much sense as using one with an in-ground pool. It will extend the swimming season, and it will be less expensive than a full-blown installation. Below are two of the best pool heat pump options for above ground pools up to 12,000 gallons. If your above ground pool is bigger than that, use our calculations that follow the reviews to find the best pool heat pump for your pool. Remember that you need an external pump like a filtration pump to provide water flow through the heat pump. If you do not have one yet, it’s a cost to consider. 50,000 BTU above-ground pool heat pump. Fast and efficient heat pump. This is simply a smaller version of the Hayward Heat Pro. The injection molded UV-resistant acoustic cover of the Hayward HP50TA looks the same as its big brother. It uses the same profiled fan blade to ensure quiet operation. It also uses the same Ultra-Gold corrosion resistant evaporator fin to extend its life expectancy way beyond standard aluminum fins. It also uses the same type titanium heat exchanger. Durable components that are impervious to rust and deterioration is what makes the Hayward HeatPro one of the best pool heat pumps on the market. As I’d have expected from the brand, the Hayward HP50TA HeatPro use a quiet scroll compressor, stainless steel hardware and a polyethylene screen to protect the evaporator coil. It’s equipped with 2 x 2 1/2 inches CPVC union plumbing connections for the water connections. A chlorine generator mounted downstream to the unit, will not affect the heat pump. All HeatPro machines have the same features and controls, use the same timer, and built-in thermostat. As with all pool heat pumps, you want continuous water flow through the heat pump. When the flow stops, the heat pump will shut down. For a 50,000 BTU Hayward the running costs calculated from the given data, depending on where you live, will be between 30 c/hr and 62 c/hr using the Dec. 2017 data. At the most $14.88 /day when heating the pool for 24 hours. Remember that a thermal pool cover will cut the costs in half. The same service support system and warranty that covers the bigger units, apply to the smaller heat pumps too. So you’re assured of excellent lifetime support from a company that Americans have come to trust over many years. Includes an impressive 10 year warranty. 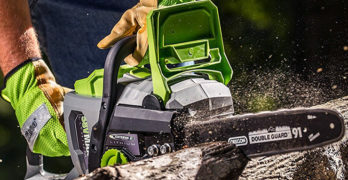 Runs exclusively on a 12 gauge, 220 volt circuit (not 110 compatible), drawing the same power as a standard table saw. Quick installation takes less than 30 minutes with 1 1/2” compression fittings. CE approved and covered by our industry leading, 10-year warranty. ✓ View or download the MANUAL for the FibroPool FH 055. With an output of 55,000 BTUs, the FH 55 is capable of heating above-ground pools up to a 21′ diameter round or a 15′ X 30′ oval pool. It can also be used for an uncovered in-ground pool of up to 10,000 gallons. It will even service a bigger pool that has a thermal cover. Just the like the Hayward machines, it uses a Copeland high-pressure scroll compressor and an all-titanium heat exchanger. 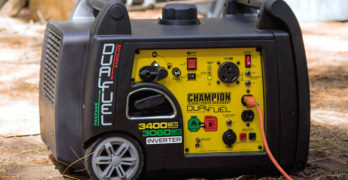 The units only work on a 12 gauge, 220-volt circuit and are incompatible with 110 V supplies. The cover is an all-metal, enamel coated case. It should stand up to all kinds of weather, and it’s easy to clean. It has an intuitive digital control for adjusting and controlling the unit which can be extended to somewhere convenient with an optional extension cable. Established in 2002, FibroPool designs and manufactures equipment and hardware for the swimming pool industry. They are based in Bay Saint Louis, Mississippi. The units originate from China mainland, and it’s CE approved and covered by a 10-year warranty. The FibroPool running costs when using Dec. 2017 data and depending on where you live, will be between 30 c / hr and 62 c / hr. At the most $14.94 /day when heating the pool. A pool heat pump is a significant investment, so it’s worth spending time and effort to ensure that you buy one that will do the job. So, how do you determine what size is right for your pool? You will find lots of calculators and tables on the internet that can guide you in this respect. Unfortunately, they produce varied results, so I did the research for you. The result is a trustworthy guide with explanations and an example. To know what size heat pump you need, you have to know how many gallons of water your pool holds. You also need to know the surface area of the pool and understand the influence of evaporations and air temperature on the heating process. You need to calculate the pool size by determining the surface area. Then you need to calculate the volume of the water in cubic feet and finally, convert it into gallons. With that information, you can determine the size of pool heat pump that will warm up the pool to a comfortable temperature. Next, you have to estimate how much heat is lost through radiation and evaporation. Because of all the variables, no method is perfect, but you will at least get close and not end up with an undersized unit. An oversized unit will cost more, but it will be more efficient. L-shaped pools: consider the pool as two rectangles, calculate the size of each, and add the two sums together. To estimate the average pool depth for a pool with a sloping bottom, measure the deepest part of the pool, add it to the shallowest part, and divide by two. e.g. (4+2) ÷ 2 = 3ft. To calculate the volume in cubic feet you multiply the surface area by the average depth. example : 800 x 3 = 2400 cubic feet. Volume (Gal) = 7.5 x the calculated pool volume. Using our example of a square pool: 7.5 x (40 x 20 x 3) = 18,000 Gal. First, we calculate the BTUs needed to heat the pool to the desired temperature (Heat up BTU). Next, we estimate the BTUs that are used to contain the temperature losses due to evaporation (Surface BTU). Total BTU = Total heat load in BTU/hr. Surface BTU = 5 Btu/hr. x (Surface area) x (temp diff). In summary then: You need a 142,000 to 150,000 BTU unit to heat and maintain a pool of 20 x 40 x 3 Ft. from 60°F to 80°F in 48 hours, and it will use 80,000 BTU to maintain the pool temperature. To achieve even more savings, you can reduce the evaporative heat loss dramatically by adding a thermal pool cover and be happy with an 80,000 to 90,000 BTU unit. The pool cover offers big savings in running costs, reduces water loss, and helps to keep the pool clean. The disadvantage is that to swim you have to remove it and replace it afterward. However, some companies offer excellent powered pool covers making it effortless to use. Alternatives to the pool heat pump use burners and heat exchangers to heat the water and either burn piped gas, oil or propane. Pool heat pumps are the most environmentally friendly of these solutions because no combustion process is used. Solar heaters are a popular environmentally friendly solution with the lowest running costs. Solar heaters have no impact on the environment but, unfortunately, they are the least efficient pool heaters. Because they rely on the heat from the sun, solar heaters work best in places like Florida, but it cannot be used everywhere. The running cost of a heat pump is lower than combustion heaters. Even the more energy efficient gas heaters do not offer savings that compare to heat pumps. If ground source heat pumps are viable where you live, the savings are even better. Heat pumps require less maintenance than combustion types. Once a year, there is some inspection work to be done, and it must be cleaned out. This is something you can easily do yourself. Every three to five years, a professional installer may have to service it. Heat pumps are safer because there is no burner or pilot light. A heat pump’s expected lifespan can be up to 50 years. But in real terms, the average life-span is somewhere between 14 to 15 years. Upfront, the heat pump is the most expensive solution. However, savings on their operating costs translate into long-term savings on running costs. A qualified electrician must make all electrical connections according to the local electrical codes. Installation fees are high, almost the same as the heat pump itself. An option is to do it yourself and have it certified before using it. In freezing climates, it’s necessary to drain the heat pump to prevent freezing during the winter. This is because the heat exchanger is made of thin titanium that can crack when water freezes inside it. Geothermal heat pump systems, also known as Ground Source Heat Pumps (GSHPs), operate by harvesting heat from the earth. If you live in an area where it’s desirable to heat your pool for extended periods and where geothermal is possible, it should be considered. Geothermal heat pump systems collect heat from the constant stable ground temperature instead of the surrounding air. When the outside air temperature drops below 41 °F, a conventional heat pump becomes less efficient. The geothermal swimming pool application works because the underground temperature will remain at a constant 40° F to 70° F (depending on your location.) This holds true even when the air temperature in winter drops to -30°F. The capital costs of installing a ground source heat pump are high compared to other HVAC systems. Though this cost is offset by the benefit of extending the pool season a lot longer than with a conventional heat pump. If you can find an underground source of higher than 70°F, your heat pump will run at maximum efficiency, regardless of the air temperature. Most installations involve laying lengths of pipes underground, a few feet deep. If you have an established garden it may not be a popular move, an alternative is to find an underground heat source like water. Solar swimming pool covers prevent pool water and chemicals from evaporating. Heavy-Duty Polyethylene material is used, and it retains heat by preventing evaporation. Solar covers help raise the water temperature by absorbing sunlight during the day. At night, the heat is further retained due to reduced radiation losses. The benefit is that heating costs are lowered, and it’s possible to use a lower cost heat pump. It also extends the swimming season and keeps the debris out when the pool is covered. More significant savings come from a reduction in water evaporation. The cost of pool covers are relatively low and to limit deterioration, the material is resistant to ultraviolet rays. Lower chemical consumption is another advantage of using pool covers. Some covers float on top of the water and can be cut with scissors to fit the pool shape. Others are installed on supporting rails to keep it in place and neat. The most expensive ones are installed lower than the coping tiles of the deck and can be operated with a remote. It can be fitted to any pool shape without affecting its outline. It’s the neatest possible solution and also very convenient. A heat pump can typically be set to only run during specific periods of the day. You use this function to let the heat pump operate mainly during the hottest part of the day when it’s most efficient and thus saving as much energy as possible. If you only use the pool on weekends, as most of us, it’s more cost-effective to let the machine maintain the water temperature at or near the desired temperature. When you’re not going to use the pool for an extended period, turn the heat pump off, or at least decrease the temperature setting by several degrees. A vital requirement to the life of your heater is proper pool chemistry, be sure that the total alkalinity and TDS is within range. I earnestly recommend that you check your pool chemistry at least weekly. In the long run, it will save you a lot of money. The pool pump must be cleaned out from time to time. Before you service the unit, you must turn the breaker off for your own protection. Dirt can accumulate on the evaporator that you can readily remove by using a non-pressured water spray making sure you do not damage the small aluminum fins. You can clean a plastic cabinet with a brush and soap, followed by a good rinse. Inspect the internals of the box for signs of water leaks while you clean the machine. When you are satisfied that the pool heat pump is still in good order; turn on the breaker. When the machine starts working, a final test is to ensure that the air coming off the fan is about 5°F cooler than the surrounding air. Always make sure you clean out the filter basket when attending to the pool equipment. A blocked filter will reduce the flow through the pool heat pump and may cause it to stop. You should also regularly backwash your pool filter to ensure that the water flow rate remains at an adequate level. Pool heat pumps are designed for outdoor installation. It relies on the flow of fresh air through the evaporator to heat the pool. If installed in a fully enclosed area, such as a shed, garage, etc. the cold air will recirculate back into the evaporator coil and substantially reduce the unit’s heating capacity and efficiency. Do not install the heat pump under a porch. Position it at least 24 inches from a wall or from any other obstruction and where downpour from the roof onto the pump is not possible. Use either a concrete base, paving slabs laid on sand or timber decking as a base for the installation. Make sure it’s level. A sturdy base, wholly isolated from the building foundation will prevent sound or vibration transmission into the home. The installation can be above or below water level, as long as the pump is powerful enough to maintain the flow rate that the heat pump needs to operate. Condensate usually drip from the heat pump when in operation, particularly in humid conditions. Depending on circumstances, the heat pump can produce as much as 3 to 5 gallons of water an hour. You should consider channeling it away to somewhere. Some heat pumps have a water outlet tube, or a piece of hose can be attached to it to divert the water away, it can even be added to the pool to reduce the effect of evaporation. Don’t mistakenly think that the heat pump has a leak when in fact it’s normal condensation. Remember that units mounted on timber decking will cause rotting to the timber if the water is not diverted away from it. Before you order your pool heat pump, you should ensure that your electrical supply is adequate. Check the running current and peak current and possibly confirm with an electrician that your house wiring will support the additional load. It may be that the current supply at the pool pump sub is not sufficient and a new or additional cable must be installed. Most installations will require a new sub and cable back to the home supply. A dedicated breaker for the heat pump is required in the home. The highest current drawn from the electrical supply will be the current listed as startup current. Even though it only lasts for half a second, the system must be able to supply a current slightly larger than the startup current. Insist on Armoured cable to supply the heat pump. 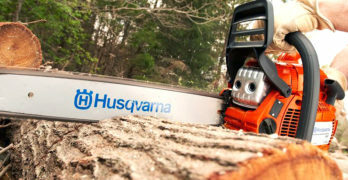 It prevents the cable from being accidentally damaged when digging with a spade. The size (thickness) of the cable required depends on the length of cable used. A longer cable must be thicker due to the increased resistance of the long cable. A proper isolator must be installed at or close to the heat pump and be clearly identified. Let a qualified electrician do the work. An electrician will also correctly earth the heat pump. Metals have different electrical potentials; therefore, you must ensure that all metal and electrical components of the pool system are interconnected. It includes the metal components of the pool, the pump and metal filter, the heater, the light and metal control valves, automatic chlorine generator, and all other metal or electrical equipment. It may be necessary to drive a 6 to 8-foot solid copper rod into the ground nearby, and connecting all components to it. It’s easy to add a pool heat pump to existing pool pipework. First, check to see what size of pipes are installed from the filter to the pool or after a chlorinator. Most pool heat pumps state the required water flow rate on their specifications table. Should the water flow rate be too low, the water in the heat pump will overheat, and the heat pump will switch off. If you find the pool heat pump is switching off for no apparent reason, make sure the water flow rate from your pool pump and through your filter is enough for your pool heat pump. To minimize pipe runs, locate the unit as close as practical to the existing pool pump and filter. Try not to use 90-degree bends and short radius elbows in the water piping, the longer the curve, the better. Do not use pipes of a smaller diameter than specified for the pool heat pump. Especially the bigger heat pumps may not have sufficient water flow through smaller pipes. Do you currently have a gas or oil-burner pool heater, and you wish to use a heat pump to reduce running costs? Leave it in place and add the heat pump to the existing configuration. This arrangement will enable you to run the heat pump as your primary heater and the old heater to supplement the heat pump in freezing weather. It will extend the swimming season beyond what a heat pump alone can accomplish. You may also use it in conjunction with the heat pump to heat the pool after a shutdown. In that case, the size of the heat pump can be calculated to maintain only the heat lost by evaporation plus 10%. Arrange the Piping so that the water runs through the heat pump to the existing heater; then the heat pump does most of the heating. You also set the thermostat on the existing heater slightly lower than the heat pump so that the current heater will only operate as a booster. The heat pump only has a “flow” and a “return” pipe. I recommend that you install a “bypass” arrangement that allows you to prevent water flowing through the heat pump. It allows you to drain all water from the heat pump in winter to prevent damage by freezing. Another superb use of a bypass valve is to adjust it for optimum flow through the heat pump. Ideally, a difference in water inflow and outflow temperatures of around 3 to 5 °F is targeted. The heat pump is normally installed as the last item in the water flow before the water returns to the pool, except if you have a chlorination unit. The chlorinator should be the last item in line before the water returns to the pool. It’s done so that concentrated chlorine water cannot prematurely corrode the heat exchanger.